As early as January 1969 Tyler boats were placing advertisements in the yachting press illustrating the complete range of yachts they either did, or in the future would produce and including what they termed the "Victory Series" of yachts..
As far as we know ALL Victory40s (including the Trintella IVs) started life in the factory of Tyler Boats in Tonbridge, Kent, England. Three prototype hulls were made. 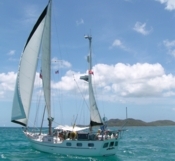 They consisted of a left and right side and a transom. The parts were subsequently bonded together encapsulating a four ton iron keel. The design was still evolving at this time. In particular, changes in the shape of the stem, the cutaway of the forefoot and the rear cabin were made. The window apertures were meant to be cut into the almost flat sides of the rear cabin and the transom. Only later was it decided to mould in recesses for the windows. At this point the project was almost killed off`and the moulds destroyed in favour of a completely different design and only narrowly survived. We believe that at least one of these prototypes still exists in the form of "Adaro" (pictured left)(recently renamed `Isle of Avalon`). 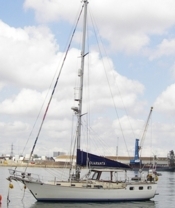 The hull was evidently acquired by a South African company "Phoenix Grp" and subsequently sold as a `Phoenix 38`. We are indebted to Neil Marchant for the above information. He was the engineer on the Victory 40 project at Tylers and was responsible for overseeing the engineering aspects of the first nine hulls. 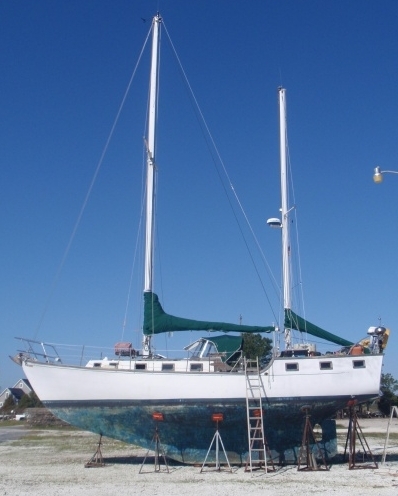 Tylers started full production of Victory40 hulls in 1970. They installed Perkins engines, Paragon gearboxes, propshafts, and Mathway Torquetube steering gear. In this form the hulls were sent 400 miles north to Scotland where Aberdour Marine finished and marketed the boats .Most went by road, but some were motored under their own steam as bare hulls containing bundles of fittings. 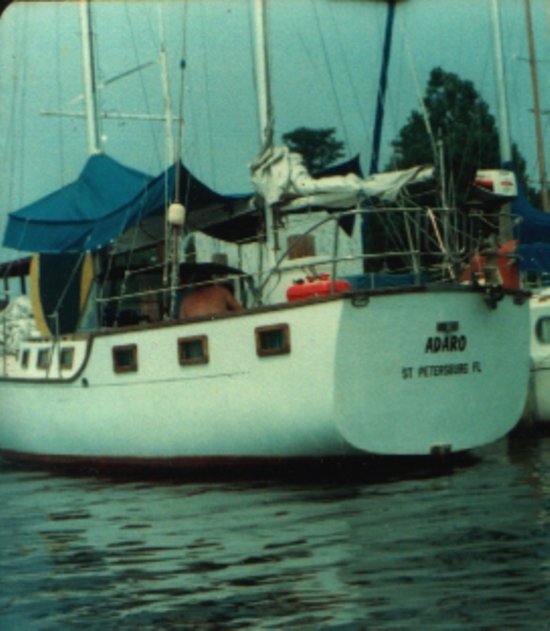 Although this arrangement continued until Aberdour Marine went out of business, from 1973 onwards, and following the first oil crisis and the start of a deteriorating British economy , Tylers also supplied 103 Victory40 hulls to the boatyard of Anne Wever in Holland. These were subsequently completed and sold as the Trintella IV. 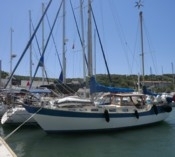 Tylers had also broadened their customer base from mid 1970 by selling small numbers of hulls to various other boatyards, who completed them and marketed them as Victory40s. 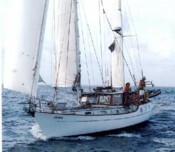 From about 1973 Tylers also made hulls available to private individuals for subsequent home completion. We would love to hear from any individuals who had any involvement in the construction of these boats. Aberdour Marine, based at Hawkcraig Point on the west side of Silversands Bay in Fife, Scotland, was formed in 1966 by Don McLachlan and others out of the ashes of Graham Finlayson`s company Marine Services. Marine Services had produced well built wooden boats in the town of Aberdour since before World War 2. 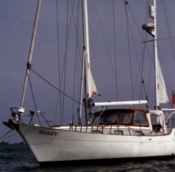 Aberdour Marine quickly established a reputation for turning out a high quality grp motor cruiser, the "Norseman”. The Norseman came about because Don McLachlan was also a partner in Viking Marine, a company which had made fibreglass lifeboats and launches for cruise liners.The 'Norseman' cruisers were produced from the moulds used to make the launches for the Cunard liners Carmenia and Franconia when they were refitted. http://www.simplonpc.co.uk/Saxonia1954.html. At the completion of the refit the mould was redundant and Don thought it would be a good idea to start building and fitting out these launches as motor cruisers …...the first of which he produced for his own use before Aberdour Marine was formed. 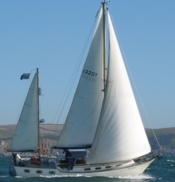 In 1969 Aberdour Marine started fitting out glass fibre Victory40 hulls from The Tyler Boat Company of Tonbridge, England.....The first, named `Scarab`, was completed in 1970. Even though there was a drawing of a `standard layout`, potential new owners would be presented with an almost bewildering array of choices of cabin layout, fittings, equipment, materials, fabrics and finishes. Hull colours offered included, (but were not limited to), Canary Yellow , British Racing Green, and Duck Egg Blue,as well as standard Mediterranean White. The decks could be supplied in matching or contrasting colours. The inventories must have been huge. The quality of the joinery and finishing work and the attention to detail was superb. 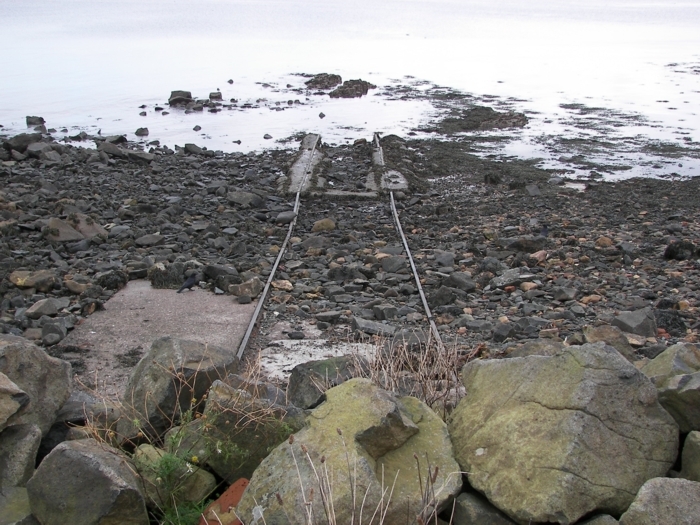 This was almost certainly down to the fact that all of Aberdour`s workforce had come from Burntisland Shipyard barely 3 miles away and which had gone into receivership in 1968. This yard had produced high quality ships for the merchant marine industry. These were highly skilled craftsmen ..the best quality Scottish “shipbuilders turned boat builders”. 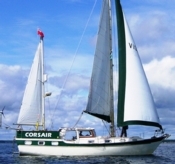 Potential purchasers of Victory40s were encouraged to visit the factory in Aberdour, to discuss their requirements, and to go for a short demonstration sail on a newly completed boat. All this, of course, came at a price, and in 1973 a Victory40 would, in round terms, cost about £22,000....roughly equivalent to the cost of an ordinary house in outer London. The 1970`s , after the first oil crisis in 1973, became a time of huge financial turmoil in Britain . Inflation went into double figures, wages spiralled, and many companies went out of business. 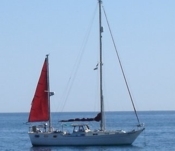 Don McLachlan and his team made many changes to reduce costs, including attempting to produce a `standard boat` with a much more limited range of options. They struggled with the economic conditions around them..
During the coal miner`s strike of 1974 the yard maintained its productivity despite a legally imposed 3-day week and power cuts. 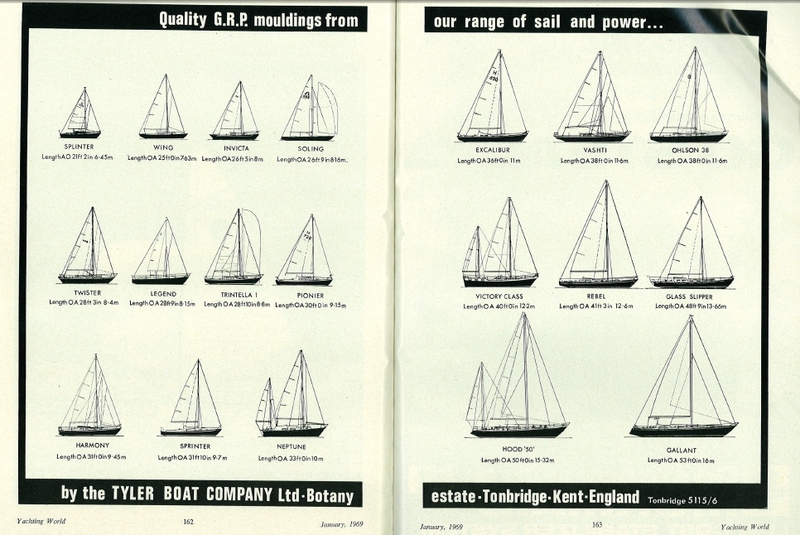 Between 1970 and 1975, Aberdour Marine turned out 23 Victory40`s......The first was Scarab, Bignor Breeze was No.2.....and Sunbird II was No.23. Construction of Norseman motor cruisers also continued during this period....(and this explains the apparent anomalies in the boat numbering system). 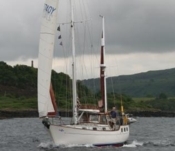 In 1975, Aberdour Marine was taken over by a local builder, Denis Thain, and then in 1977 after the company went bankrupt and following the involvement of Gordon McPherson it became Aberdour Yachts. 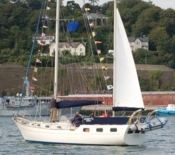 Although a very small number of Victory 40s followed after 1975, Aberdour Yachts mostly fitted out Colvic Victor hulls ...until they too went out of business in the 1980s. We are indebted for the information above to Fiona Lees who is both the daughter of Don McLachlan, and the former wife of the yard foreman and manager Erskine Johnston. Fiona also worked for a time in Aberdour Marine as the office manager. How Many Victory40s Are There? Scarab (No.1) was the first to come out of the Aberdour Marine yard in 1970 and Lady Juliana was allegedly dragged out of the gates almost completed just before the receivers arrived in 1977. Lady Juliana however has no identifying number carved on her. Frou Frou II (later renamed Askivall of Skipness) was under construction and was impounded by the receivers and subsequently completed by McGruers on the Gareloch and commissioned in 1984...but as yet we have no further details of her.....So, the best estimate of the total from Aberdour is approximately 27. Add to these a dozen or so boats that went to other yards, and probably only a handful of home completions......and the overall total must be in the region of 46 to 50 . Following the fire a new mould was made by Tylers using the last Victory40 hull. They took advantage of the opportunity to alter the boat in various subtle ways including the 'walk through' to the aft cabin and the cockpit surround being less square compared to the V40,.... and called it the Victory41. How many Victory41s were produced we do not know. 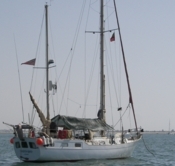 It is believed that `Quaranta` was the last (the only one ever to be fitted out as a sloop) , and when Tylers moved to the Medway, the mould, which was becoming `tired`and the design thought outdated, was destroyed. The Victory40 sales brochure* put out by Tyler in 1972 promised 100 Victorys by 1976 so it would seem that they reached their target if the TrintellaIVs are included. The Tyler factory was completely destroyed by fire in 1978 and this included all the Victory 40 moulds. Brisa Mar Originally "One Line" . Hull No 27, fitted out by WJ Hargreaves of Liverpool.